Anyhow, I the most recent number of Shell-O-Gram, the newsletters from the Jacksonville Shell Club, I noticed an article by Harry Lee about a giant shell from Mexico. “In the March-April SOG, a new species of Euglandina from southeastern Mexico was treated. It belonged to a truly remarkable group of carnivorous snails mostly from the highlands of Mexico and Central America – some of which exceeded four inches in height. 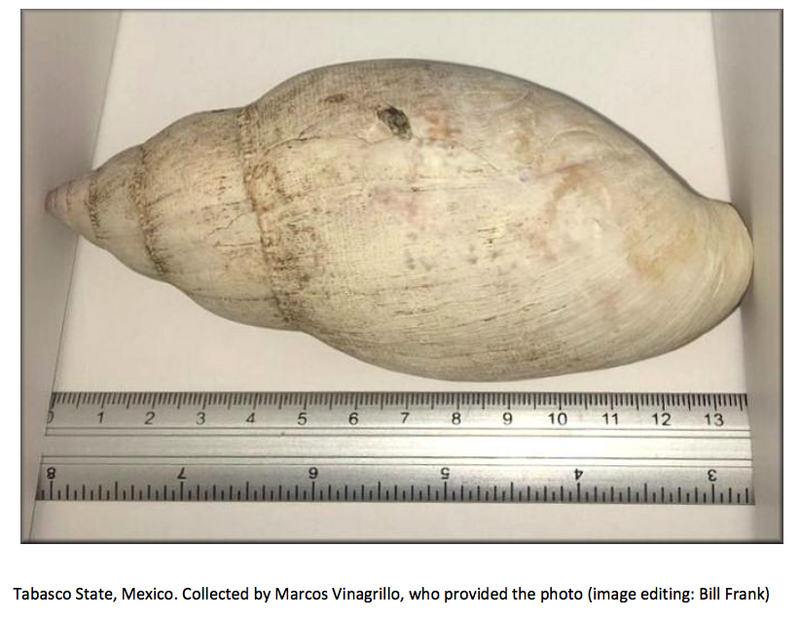 Through the magic of the Internet, a concatenation of subsequent events led to the discovery of a truly remarkable mollusk shell belonging to a closely related species, also apparently limited to Mexico. The specimen figured above is believed to be the largest native terrestrial snail shell ever found in North America, which includes Central America. Before the discovery of this leviathan, the largest known shell belonged to a congener, but it was not identified as to species (see sweepstakes tabulation on p. 9 taken mostly from the literature cited below). Now the sweepstakes winner is clearly Sr. Vinagrillo’s specimen. Olé!”. Lee, H.G., 2017. Euglandina sowerbyana (L. Pfeiffer, 1846) – a true champion shell. – The Shell-O-Gram, 58 (3): 8-9. This entry was posted in Uncategorized and tagged mexico, spiraxidae on May 22, 2017 by bramb.